Dikembe Mutombo is a Congolese-American former international basketball player who played in the NBA. The ex-center position player started out his career in 1991 and retired in 2009 as a legend. Besides basketball, Mutombo is also known for his charity endeavors. Read more about him below. Mutombo was born as Dikembe Mutombo Mpolondo Mukamba Jean-Jacques Wamutombo on June 25, 1966. His parents Samuel and Biamba Marie Mutombo are members of Luba ethnic group. He grew up in Leopoldville (today Kinshasa) the Democratic Republic of Congo, alongside his 11 siblings. At age 21, Dikembe relocated to the United States to further his education. He enrolled at Georgetown University on education grants offered by US-AID. Dikembe Mutombo had planned to study medicine but as luck would have it, he got recruited to play basketball by coach John Thompson. He studied in the ESL program (English as a second or foreign language) at Georgetown. In his first year in school, Mutombo participated in a basketball game and was able to block 12 shots. He spoke nearly no English at the time. As his academic years progressed, he started speaking English more fluently. He worked as a student intern for the Congress of the United States and also for the World Bank just like many other Washington-area college students. This was to fulfill the school’s prerequisite for graduation. In 1991, Mutombo obtained his bachelor’s degree in linguistics and diplomacy. Dikembe Mutombo started his basketball career immediately after school with the Denver Nuggets after the basketball team drafted him in the 1991 NBA draft. The player was regarded as the best overall pick in the draft. His shot-blocking proficiency produced an instant strong effect across the league. As he continued to excel, Mutombo created his own victory move. He moved his right index finger at a player and move it side to side after successfully blocking a player’s shot. The same year he developed this move, endorsements came including an invite to feature in Adidas ad that used a mantra Man does not fly in the house of Mutombo referencing his remarkable shot-blocking skills. During the 1993-1994 season, the legend was selected for the All-Star team and as you can imagine, he didn’t fail to prove that he was one of the league’s strongest defensive players. He continued scoring big rebound and block numbers. Consequently, he helped Denver Nuggets to win three straight games to pull off a major playoff upset, placing it as the first eighth seed to defeat a number one seed in an NBA game. For his exceptional skills in the first season, he was selected for his second All-Star game (1995-1996 NBA season). Again, Mutombo pulled off his masterpiece and won NBA Defensive Player of the Year title. Despite the victories he brought for Denver Nuggets, the team didn’t give him quality assistance. He was refused of his request to be granted a 10-year contract. He had to end his career at Denver Nuggets because of this refusal. The then general manager, Bernie Bickerstaff expressed his regret for this move, describing it as his biggest mistake as a GM. After he left Nuggets, Mutombo became a free agent. Fortunately, he sealed a 5-year free agent contract worth $55 million with Atlanta Hawks. As common with any team he played for, Atlanta Hawks started recording victories. Mutombo kept leading the team to many wins alongside Hawks All-Star, Steve Smith from 1996 to 1997. His role in the team won him another big title – Defensive Player of the Year title. He kept on with his streaks of dishing out exceptional defensive numbers with his new team. At the lockout-shortened 1998-1999 season, he was once again bestowed with NBA’s IBM Award as the player of the year. The winner of the award was determined digitally. The award was well-deserved but bad news came when NBA banned his signature move the same year. After a long protest, he dropped his personalized victory move but carried on his winning streaks. This won him his fourth Defensive Player of the Year award. When his substitution contract with Philadelphia 76ers expired, the player signed another four-year contract with the team worth $68 million. The next year, the table turned around in the Eastern Conference ranking as Sixers was eliminated in the first round of the playoffs while New Jersey Nets powered to the top of the standings. The team got to Finals and was to play against the Lakers. As a result, Sixers swapped Mutombo to New Jersey Nets on demand to help it stand against the likes of Shaquille O’Neal and Tim Duncan. However, Mutombo’s time at New Jersey Nets was marred by injuries. This not only limited the number of games he participated in but it also affected his performance. After struggling with his injury, he joined New York Knicks in 2003 under a two-year contract. After a supreme performance in the team including 11 blocks against the crosstown rival New Jersey Nets, he was traded yet again to Chicago Bulls in 2004. Chicago Bulls also had to swap him with some Houston Rockets players ahead of the 2004-2005 season. In his first season in Houston Rockets, the energetic player averaged 15.2 MPG, 5.3 RPG, and 4.0 PPG. At age 40, his team defeated Denver Nuggets (which was his former team). His awesome performance in the game made him the oldest player in NBA history to record more than 20 rebounds in a game with 22. In the 2007–08 season, he further helped the team win 12 more games which completed a 22-winning mark. He also recorded 5 blocked shots and pushed ahead of Kareem Abdul-Jabbar in overall career blocked shots, only behind Hakeem Olajuwon. Following this accomplishment, he stayed as an unsigned free agent for some time but later signed with Huston during the 2008-2009 season. After a fulfilled time in the basketball sphere and sustaining an injury in his last game, Dikembe Mutombo retired in 2009 as not just a basketball superstar but also an icon. His NBA career statistics throughout his career, are as follows; Points 11,729 (9.8 ppg) Rebounds 12,359 (10.3 RPG) Blocks 3,289 (2.8 bpg). Mutombo has also been honored for both his basketball career and humanitarian works. He is multi-linguistic; speaks English, French, Spanish, Portuguese, and five Central African varieties, including Lingala and Tshiluba. Mutombo no longer plays basketball but while he was still active, he earned about $140 million in salary. This has helped him stockpile some fortune for himself. Currently, he is said to worth $75 million. 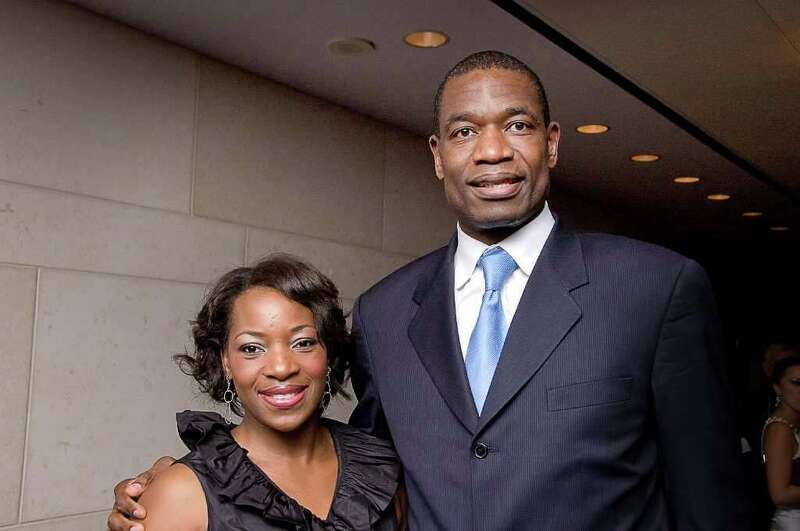 Mutombo is happily married. He missed getting married to his ex-lover, Michelle Roberts, a medical student as she declined to sign a prenuptial agreement the day before the wedding. The athlete eventually gave marriage a second chance, wedding his wife Rose who is from the Democratic Republic of the Congo. The lovers are happy together. The duo is blessed with six children (four out of the six are adopted). One of Mutombo’s adopted children is his son who is 7 ft 7 ft. He adopted the 17-year-old because he reminds him of his youth. Mutombo is tall, dark and handsome.These are basically the features most women admire in men. As for his height, Mutombo stands at a height of 7 ft 2 inches (2.18) – way taller than an average American man. His body weight is 260lb (120kg).